Brothers Nama (L) and Damara (R) enjoy their outside exhibit at the Zoo. The Milwaukee County Zoo regrets to announce its single male cheetah died yesterday while under anesthesia during a medical exam. Nama cheetah arrived at the Zoo in 2006, from the National Zoo in Washington, D.C., along with his brother and littermate, Damara. Nama was 9 years old. The mean life expectancy of cheetahs in zoos is 11 years old. Damara was euthanized in 2013 due to chronic health issues and poor quality of life. A complete necropsy (animal autopsy) will be performed to determine the exact cause of death. Preliminary results will be available in the next few weeks. 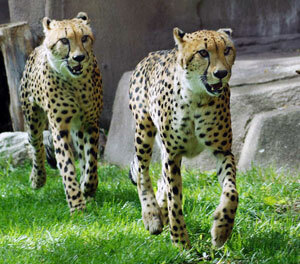 The Zoo hopes to exhibit cheetahs again in the near future, in keeping with its current large mammal collection plan. Most cheetahs in the wild are found in the eastern and southwestern parts of Africa. It is believed only 7,000 to 10,000 of these big cats remain, and those are under pressure, as the wide-open grasslands they favor are disappearing at the hands of humans. For further information, please contact the Zoo’s Public Affairs and Services Division at 414.256.5411.